“We hereby announce the success investment in OpenSparkz in November 2017 to provide 100% of the OpenSparkz seed funding round requirement…” said Andrew Lo Chairman and CEO. “…it’s definitely a golden opportunity to seize the customer loyalty sector in Asia…” he continued. 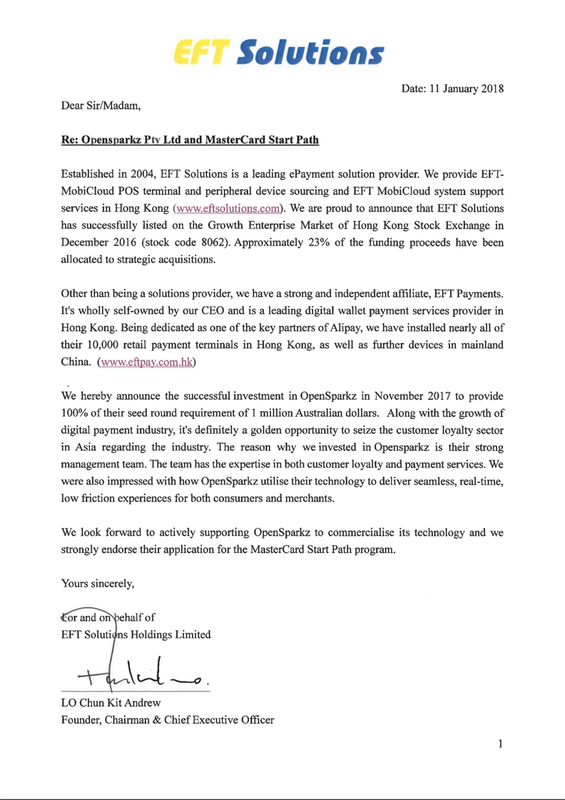 OpenSparkz welcomes the support and funding from EFT Solutions in this seed funding round. If you want to read the full press release, click here to view a copy. Click on the names to find out more about EFT Solutions and EFT Pay. If you have any questions about OpenSparkz or how we are revolutionising loyalty and payment services, get in touch here.